Sotheby’s and the Italian winery Ornellaia joined again this year for the tenth edition of the Vendemmia d’Artista. 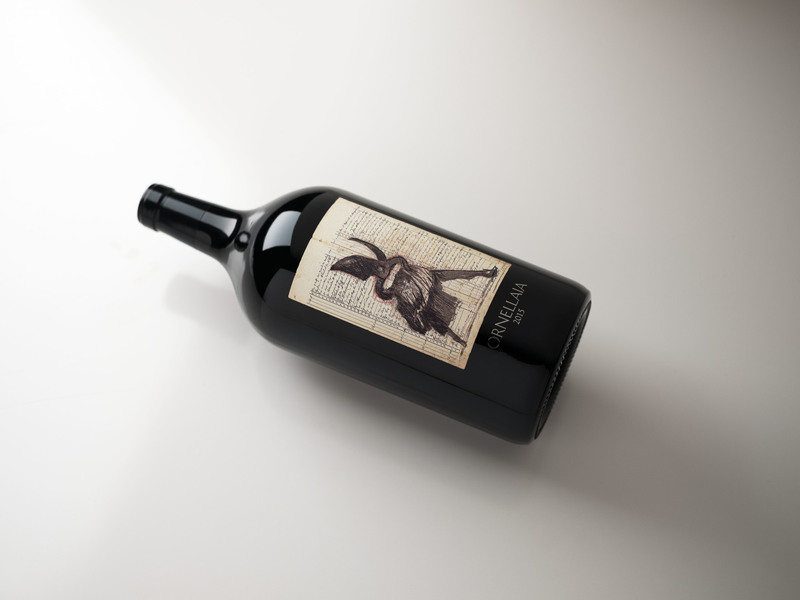 The famous winery from Bolgheri called upon William Kentridge to design the labels for this anniversary. The benefit auction raised € 140.000 that will be donated to the Victoria and Albert museum. Vendemmia d’Artista brings together fine wine and contemporary art. Ornellaia’s winery, enlisted among the Super Tuscan wine producers, started this project ten years ago. All the editions are characterised by a different theme, chosen by the wine house to embody the peculiarities of the wine of that year. 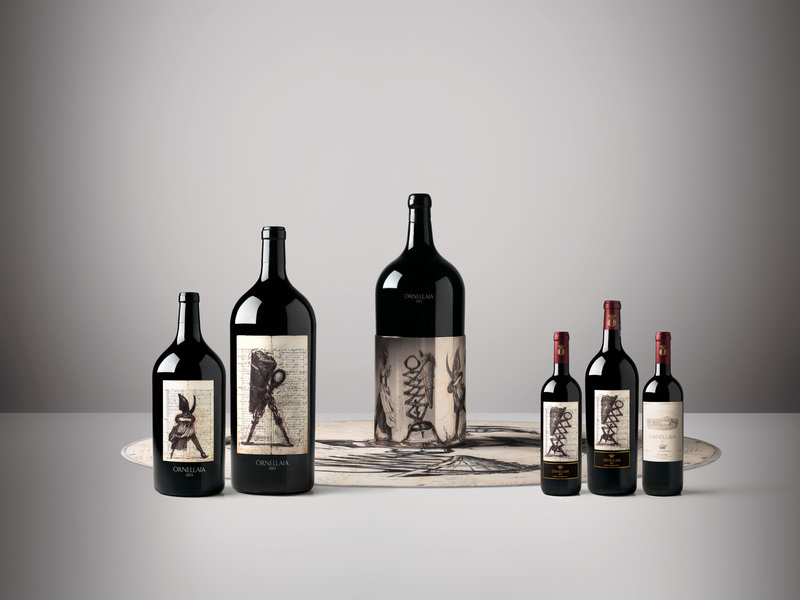 Each time, then, Ornellaia invites a different artist to design the labels for its bottles. The precious bottles, with their artistic labels are, finally, sold at a charity auction organised in collaboration with Sotheby’s. 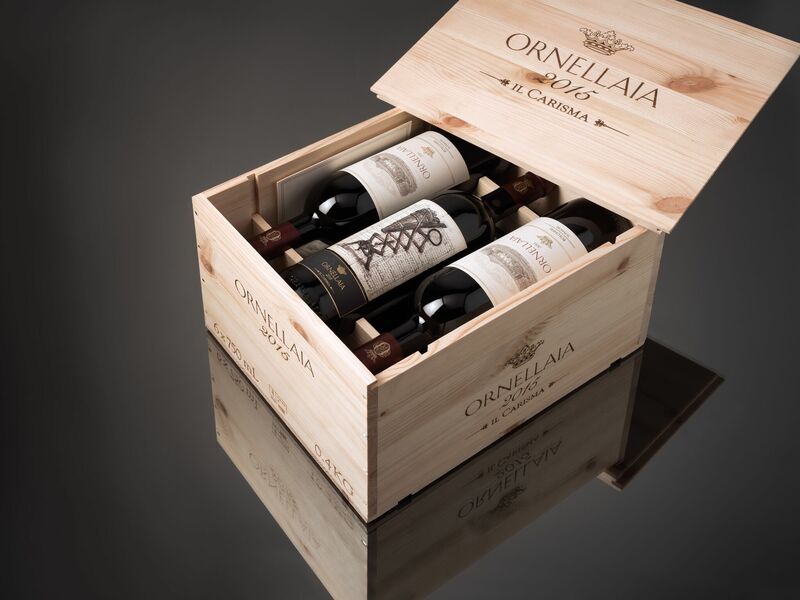 The profit is donated to the art institution which Ornellaia collaborated with. 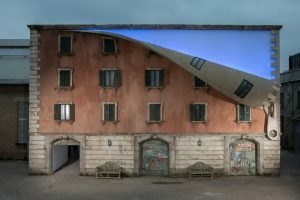 The Italian winery has up until now collected up to 2 million euros all for the benefits of the art world. This year, the lucky museum was the Victoria & Albert, where on 23rd May the nine lots realised a total of £ 123.000 (€ 140.000). The auction was the culmination of a sumptuous dinner, held in the Raphael Room of the Victoria & Albert museum. Tristam Hunt, director of the London institution, was extremely grateful for this partnership. He confirmed that the money gathered in the auction will be devolved to the development of the new V&A photography centre. Since the beginning of Vendemmia d’Artista in 2009, Ornellaia has collaborated with artists working in different media, from sculptors to photographers, coming from different parts of the world amd backgrounds. Previous editions saw names such as Luigi Ontani, Ghada Amer, Reza Farkhondeh, Zhang Huan, and Michelangelo Pistoletto, among many others. This year it was the turn of the South African William Kentridge. The theme to interpret was Carisma (Charisma). This adjective captured the virtues of the 2015 vintage, which marked the 30th anniversary since the first vintage of 1985. This year wine has been described by Giovanni Geddes da Filicaja, CEO of Ornellaia, as just perfect, after two difficult years. ‘Like people of great Carisma, wines of great vintages know how to impose themselves naturally, without force, their balance allowing them to shine without having to flaunt themselves.’ concurred Axel Heinz, winemaker and Estate Director. 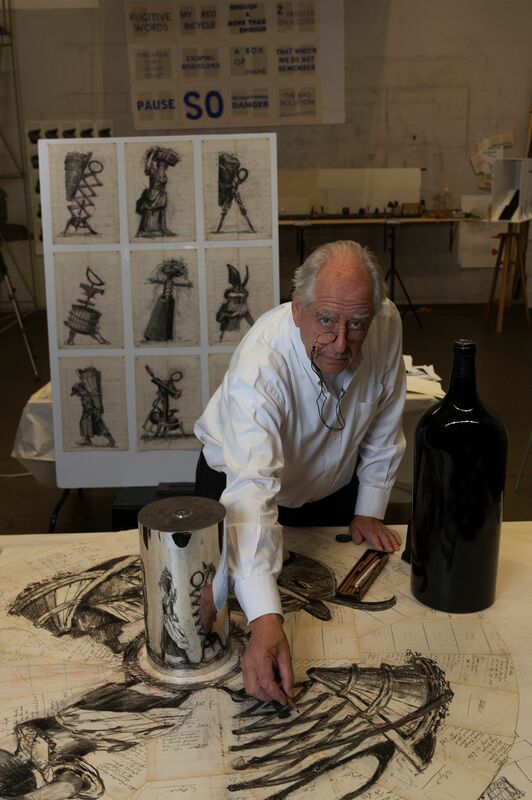 As the wine house itself claimed, William Kentridge perfectly embodied and expressed the Carisma of the product. The winery embraced Kentridge’s eclecticism and his total approach to the art world. The artist, in fact, not only specialised in any media, from painting to performance, but was also recently involved with the opening of his Centre for the Less Good Idea in Johannesburg. Inaugurated March 2017, it aims at being an ‘incubator’ where young artists can develop and share their ideas and art. The labels designed by William will be placed on one bottle for every six standard sized bottles contained in the wooden wine cases. The artist also envisaged the designs for a limited-edition set of bottles. This included a-hundred 3 liter bottles, 10 imperials, and one Salmanazar. This last 9 liters bottle of fine Ornellaia’s red wine, was a unique piece. Its label represents a specially prised work of art. All bottles were numbered and personally signed by the artist. William was also asked to produce an artwork for Ornellaia to exhibit in their estate. The winery, in fact, keeps a collection of all the oeuvres of the artists that joined the house for the Vendemmia d’Artista. The range of works is open to the public, that can visit it while tasting the wines in the Tuscan wineyards. The South African artist created two site specific sculpture, one resembling a screw and one of a figure carrying the grapes. They will be made from steal cut outs of 20 mm thickness, painted black, each one weighting ton of still, 3 meters high. The auction was the coronation of a magnificent dinner held in the Raphael Room of the V&A. The artist was present at the gala, where he introduced his inspiration or the labels to the guests. Kentridge affirms that he was strongly influenced by the technical process of wine making itself. The labels, in fact, depict the toolkit and symbols of the vendemmia process. The very instrument he had personally used in one of his several visits to the peninsula. Starting his drawings, Kentridge had indeed in mind an experience he had done with his family in the Tuscan region some time ago. With wife and children, he spent six months in San Casciano, a small village at the outskirts of Florence. One morning, since it was the season of the vendemmia, he decided to go with his wife to help the farmers producing some wine. He thought it would be fun. Easy, even. What he found out, anyway, is that producing wine is far from simple. In just one short morning, William grasped the hard work that goes into this difficult process. 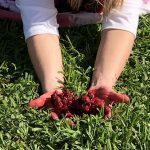 He recalled how his wife was very meticulous in picking up any single grape that would fall in the ground. He hated (but I BElieve was also fascinated by) the fact that your hands get stuck in the grapes juices and everything gets sticky. He was much more hasty than his partner, but still he felt the fatigue. 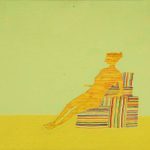 William’s art was shaped by his experiences in his native country. Having lived the height of the apartheid in Africa, he usually transformed political events into satyrical allegories. This time, for the Ornellaia label, he focused more on the Italian history and the politics of wine making. The very technical features of wine producing alimented his designs. Italy, as well, has always played a strong part in William’s work. He produced more works in Italy than anywhere else. Italy and wine were everywhere felt in the artist’s works of art. They were reflected both in the iconography chosen, as well as the background of many of the drawings. Kentridge used some Italian cash books he found ransacking markets and vintage shops. These cash books were not from Ornellaia, but were certainly Italian. You can immediately recognize the handwriting. The artist claimed that to use written pieces of work, to subsequently add on top some king of drawing, is very common in his practice. The hard part of this procedure is to find the right paper. The cash books fit their role perfectly. The 17th century paper had the right texture, humidity, thickness. The artworks composed by William were also commenting on the process of transformation. The grapes you eat become wine. The cash books the artist took and drew upon became art. Ironically,William also reflected about that time in which he almost transformed paper in wine. A school friend of him had just became an important importer of wine. William wanted to try some of his Chablis, and his friend accepted provided that Kentridge would send him one of his drawings. At the press conference William laughed remembering when his friend told him ‘you know, in 8 years all this wine I am sending you will be finished, while I will still have the drawing!’ To what William replied: ‘don’t worry there’s more paper, i’ll make you another drawing and you’ll send me more wine’. And so he transformed paper in wine. 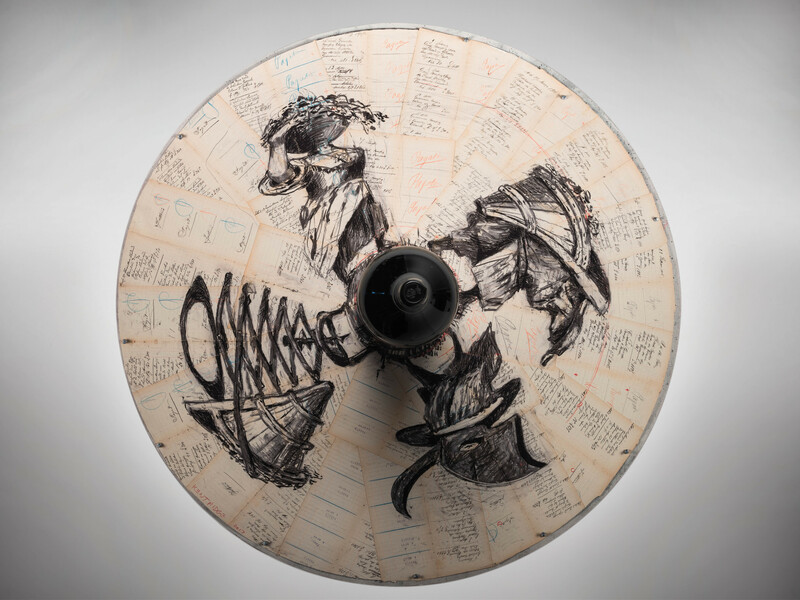 This entry was posted in ART, NEWS and tagged #benefitauction, #kentridge, #label, #ornellaia, #victoriaandalbert, #williamkentridge, ART, Auction, Design, drawing, Italy, Sotheby's, Wine, winery. Bookmark the permalink.